Whether this is your first on Bali or another happy return, the island is changing since this tropical paradise is getting more and more popular. Visa requirements, transportation, accommodation, where to go and what to do? You will find the information here to prepare your trip! When you arrive on Ngurah Rai international Airport (Denpasar) in Bali and you want to stay less than 30 days you do not need to buy a visa on arrival. You can go straight to customs and get a 30 days stamp in your passport, skip the Visa On Arrival counter. If you want to stay up to 60 days and you did not organize a visa in your own country beforehand you do need to buy a visa on arrival (VOA), this is the intention not the extension. Within the first 30 days you need to go to an immigration office on Bali to extend. This takes a few visits and up to a week, so do not wait for too long and dress properly / cover knees and shoulders when you go. If you are staying in the south, make sure to check to which immigration office you need to go, their opening hours, etc. We went to the closest one, Kantor Imigrasi Kelas I Denpasar in Denpasar first, but we needed to go to Kantor Imigrasi Kelas I Khusus Ngurah Rai (Nusa Dua) since we stayed in Canggu. Once you are exiting the arrival area dozens of official and unofficial taxi drivers will try to get you in their car. Blue Bird is an official meter taxi company but not everybody wearing a blue shirt works for them and not all meters work the same. You can buy an official ticket at the counter before you walk through the last duty free shop. This is where all the signs are for the airport pick-ups from the hotels. Expect another dozen of people with name signs on selfie sticks with international arrivals. Most of the airport pick-ups I checked were way more expensive than meter taxis, make sure to check if you are on a budget. Bali is called The island of The Gods. Many spirits and beliefs are worshiped on the island with respect. Be careful not to step on the little offerings that are put on the street and in front of shops and houses everywhere. You have landed in the Asian tropics! Things to expect: Ice in your beer, sugar in most of the drinks, language barriers & cultural differences. Mosquitoes, cockroaches, gekko's, rats & sunburn are common too. Prepare yourself for these things! Bali is a big island! The good thing is that is has something to offer for everybody. The south is well developed and easy accessible but has many traffic jams. The northern parts of the islands have more bumpy and curly roads since the landscape has many hills, mountains and volcanoes. You can check the schedule below for a quick overview. Unless you want to spend your time on Bali in the same place it is nice to explore the different sides Bali has to offer. 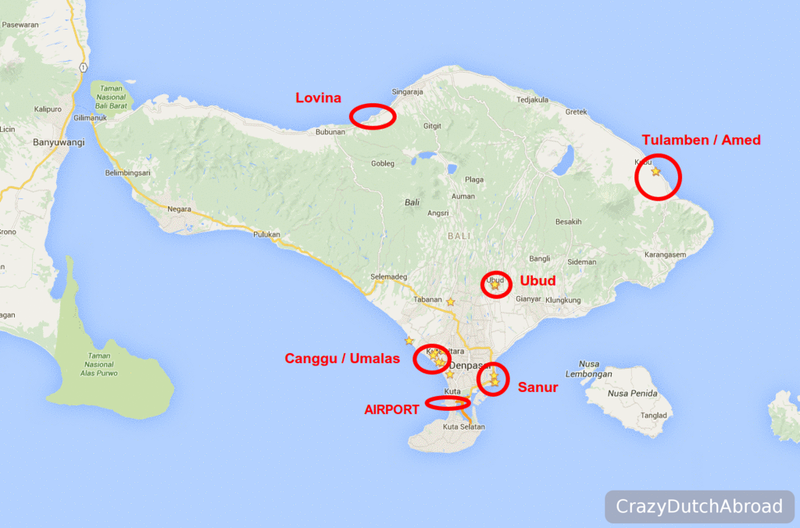 I would recommend staying at least in three different areas, North (Tulamben/Amed), Central (Ubud) and South (Canggu/Umalas). Of course, this all depends on your interests as well. 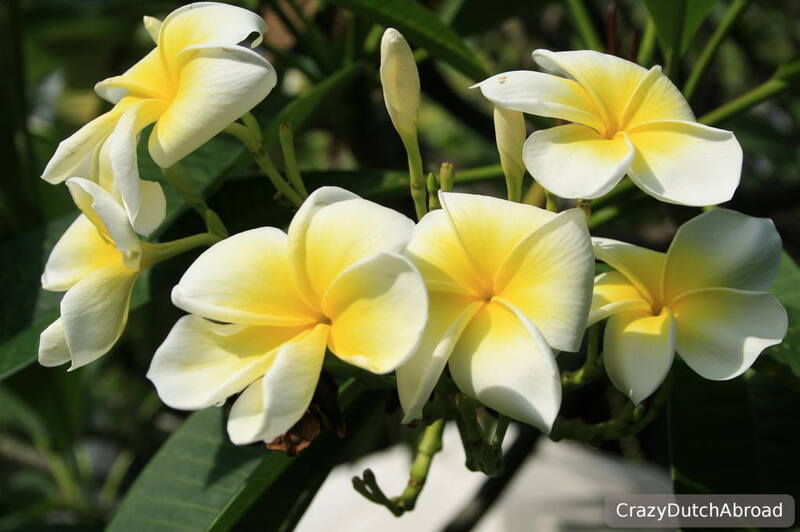 If you like luxury, pampering and everything organized - like home - the Kuta region is probably the place to be. The beaches are nice and everything is well-developed for tourism. The furter North of Kuta you go the greener and more local the towns become while the beaches are still great and the sunsets are amazing. Culture lovers are likely to head out to Ubud while quiet beach lovers and SCUBA divers will go North to Padang Bai and Tulamben / Amed. If you need to drive a few hours to your destination on Bali you might want to consider a night around the airport to relax after long flights with stopovers, etc. My recommendation, if you want to get to /from the airport in less than 10 minutes, is Bahana Guest House. This is right outside the airport area, close to the roundabout. Bahana Guest House has a swimming pool and is quite new. The room was really spacious with a separate kitchen and bathroom area. Within 5 minutes walking you will find several supermarkets, ATM's and local restaurants. We had a nice dinner with a Bintang beer at the restaurant on the parking lot of Hotel Puri Nusantara. If you are heading north-east of the island or if you want to stay in Denpasar, MarsCity Hotel is perfect. The hotel is brand new, the staff is very friendly and the breakfast is good. As mentioned above the Blue Bird Taxi group is the official meter taxi. Almost every hotel has its own friends and family members with a car willing to take you everywhere as well. It is not always cheaper, make sure to bargain. Hiring a car with driver for sightseeing is always possible. It works the same. Do not expect explanation in English about sights and cultural things, for this you need to book a proper guide for the day. You probably know Uber, and they are well presented on Bali. The prices are way lower than Blue Bird and in my opinion they are more reliable as well. Besides Uber there is Go Jek (offering scooter services from rides to shopping needs) and Grab Taxi. Since there are many traffic jams in the South of Bali, make sure to calculate some extra time if you go by car. Scooters can pass the traffic jams, but it can be quite a challenge since it is common to take-over cars on both sides and by using the wrong lane. People honk the horn of their scooter and cars constantly, you will get used to it easily as there is simply no way of understanding every single meaning. If you rent a scooter in Asia for the first time, make sure to stay in the tourist area for the first day to get used to the traffic and rules. Once you go driving around the island or in Denpasar different rules apply. One thing to remember is that most of the rules are more like guidelines and respect for each other is higher valued. Go with the flow would be my best advice, and go slow. Use your mirrors a lot and look around constantly! Make sure to wear long sleeves and pants or use a lot of sunscreen if you go on an Island tour. If you would like to stay connected to the internet for work or other matters, buy a local SIM card with data. This is way more reliable than the WIFI connections in hotels and resorts. Since we work online and we need to be connected almost 24-7 we bought simPATI (Telkomcel) SIM-cards with data. It works perfectly around Bali and on other Islands, most of the times better than the WIFI but you always have a back-up. You can buy a SIM-card and top-up in most of the shopping malls as well as the local telephone shops. The prices vary, in the airport you probably pay the most commission. You can also top-up online with the App, it saves the commission. On Bali as well as on other islands there are different regional packages (called FLASH with simPATI) as well, make sure to check what you buy is you are planning on moving around during your stay. There are some cultural sights you should definitely visit when you are on Bali. The rice terraces, a Balinese dance performance and beautiful temples and water palaces. 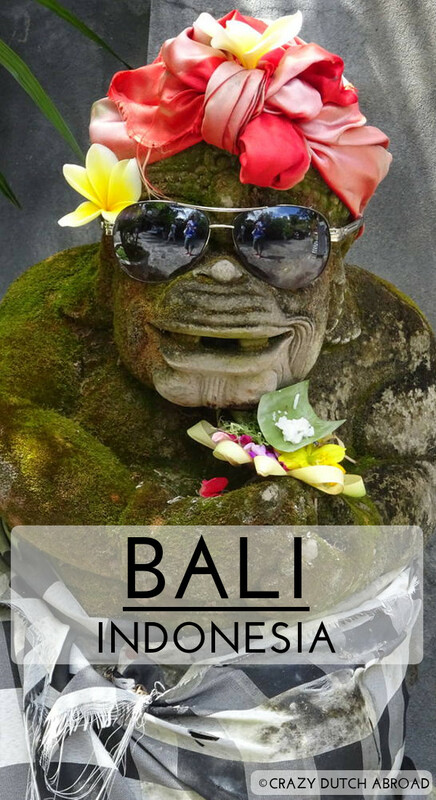 Click here to explore the 10 must sees of Bali! Places to explore on Bali!